EVANT, TX — One family's investment in Central Texas has helped breathe new life into a dying town. For years, the town of Evant slowly began to lose their population and business to bigger towns. But an unusual project has began to turn Evant around. Kenny Burlison and his wife say they stumbled upon one of the most unusual places in Texas by accident. "We used to drive back and forth here and we kept seeing them building something, so I inquired," Burlison said. He found the Buena Vista Wildlife Safari and RV park in Evant where Coryell, Hamilton and Lampasas Counties come together. John Drennan's family has owned the land since the Civil War, and he wanted to put this unique property to good use. "We thought we'd build this as an economic engine, if you will, to develop some tourism and get some activity in town,” Drennan said. It worked, and brought as many as a dozen new businesses to Evant. It's also bringing new life into the shops here. You'll find cabins, playgrounds and RV hookups of course... but if you venture deeper into the park, you'll see what really makes it unique. The park has nearly 330 acres, 23 species of animals and dozens of gorgeous and beautiful views. The former hunting preserve has exotic animals from all over and visitors can drive through the park for a close-up view of animals we rarely see. From buffalo, to zebras and wildebeest, the animals roam free while people watch them from their vehicles. "We wanted to have a little bit of the world, so that people can see the world without ever leaving Texas,” said D'Ann Drennan. 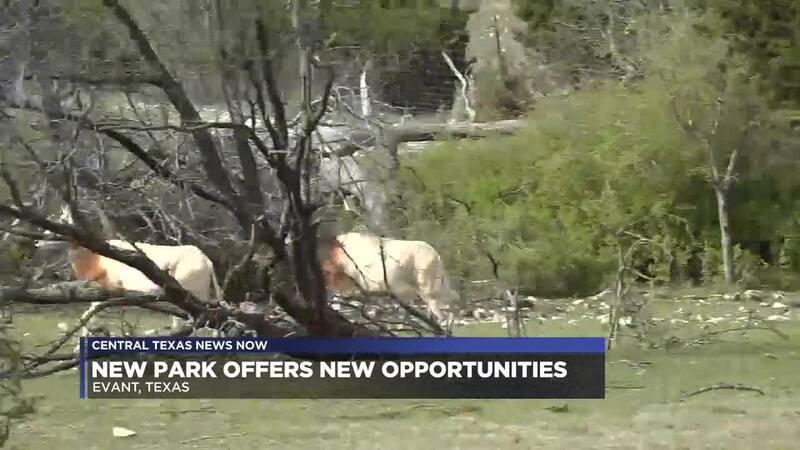 Visitors can expect fascinating animals in native surroundings and breathtaking views of the Texas Hill Country. "Everything you see around here is a view. We love the animals in the safari park,” said Burlison. And just as the Drennan's hoped, their park has began to bring more people like the Burlisons to this far-flung corner of Central Texas for a peek at the world, and the peace and quiet of the country. You'll find the park open almost every day of the year. If you'd like to learn more, visit their website .